When talking to different open water swimmers one often find that they may highlight different skills and areas on which they believe it’s important to focus. Since I’ve written a lot about cold, it’s a safe assumption (and correct) that subject is one of mine. But there’s another I don’t write about enough, parly because it’s not so amenable to written description, and that’s rough water swimming. Rough water experience is essential to be able to deal with sudden changes in weather and water conditions. It makes for a well-rounded and adaptable open water swimmer, and I think skill in rough water is essential of ongoing safety. For swimmers aiming for a serious target like an Ironman or first 5 or 10 k swim, I think one should train in as much rough water as you can tolerate, always being aware of the injury potential. Rough water is a pretty broad description though that varies for the swimmer according to wind direction and swim direction. Big swell with no wind will not produce rough water, where no swell and wind will. Rough water is a product of wind, usually onshore or cross-shore, and often caused by that much-disliked by open water swimmers phenomenon of wind-against-tide. Swimming into head-on wind is different to following wind and different again from cross wind. Head-on chop is both tiring and potentially injurious and will slow you down. It will also affect the normal balance of a stroke making the stroke shorter. With asymmetric short period waves, there will no discernible pattern of waves to the swimmer. Sometimes having cleared one wave, you will crash immediately into another. Repeated impact across the head and shoulders can be the main problem. Also, the timing for sighting and breathing is changed. More specifically, you need to learn to adjust your stroke. In head-on chop I drop my head lower than normal, and make a point of keeping low and maintaining rotation, difficult in the circumstances, to go partially under some of the chop and small wavelets, which minimizes the impacts. Other swimmers may have different techniques. As with all open water, try to separate your breathing from your sighting. In head on chop, as soon as you sight, you may have a sudden wave directly in front of you. Try to time your sighting from the top of a wave. In tail-chop (a following wind) I am most likely to swallow a mouthful of water. As I roll to breathe a wave can come from behind and swamp me. My solution to this is to focus more on my feet as an indicator of something coming, in essence an early warning system. Like radar but with feet! I breathe bilaterally (every three strokes to each side). Therefore if I’m about to breathe and a wave arrives from behind, I’ll instead often not breathe and maximise usage of the wave for speed, taking little surfing bursts of speed if I can. This is also a reason hypoxic training is useful, to be able to adjust breathing timing or delay a breathe to account for changing circumstances. Side-chop is the most difficult for many. Breathing into side-chop is a big problem leading to both swallowed and aspirated water. The only solution is to breathe to the other side. But even those of us who breathe bi-laterally will have a favoured side. I can’t maintain breathing on my left weaker side for a long period and not start to get tight in my shoulders, neck and biceps. However water is rarely so rough that I can’t least maintain some kind of irregular bilateral breathing to relieve that strain. As with so many other aspects, there are often local effects to complicate things further. 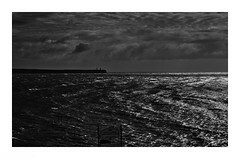 In Tramore Bay onshore winds drive chop and waves along the side of the bay, whereas in Sandycove onshore winds run directly into the outside of the island. The Guillamene is mostly deeper and it’s possible to swim further out, but behind Sandycove we swim closer in, choppy waves are reflected off the back of the island and the shallower bottom to make challenging water conditions. In Sandycove however the rough water is only a portion of a lap, whereas in Tramore Bay there’s no shelter from onshores and the bay also has a couple of spots where the water conditions changes, (passing the Colomene, outside Newtown Cove, and just inside Newtown head. Not wishing to belabor the obvious or subdivide further, there are also diagonal winds and chop. A diagonal wind and chop direction can present even more problems as you may not see nor feel it arriving. The above are just ways of using experience to adjust to the situation. With practice and experience you will discover your own methods to minimise, where possible the difficulties of rough water, but it will still always be rough and therefore more tiring. BTW, on an unrelated note, I’m not 100% about the new site layout. Any thoughts? Yea or nay? Options to adjust individual items I’d like to change from they are limited. Stay with it or go back to the last layout? ← What is post-exercise fatigue? Hi Donal, longtime reader, first time caller. Thanks for all the hugely useful info and the your scary Lovecraftian story, which I always think about when I’m on my own in the sea and the sky goes dark. I came to this post in particular because I was out at Seapoint in Dublin yesterday in force four, swimming with and against the wind between two markers. My crawl in open water (and closed) is v much a WIP and in quite marked chop I found switching to breaststroke (ever so slightly less a WIP) v handy. This meant I was stroking beneath the waves and breathing in the troughs and the change made my swim much more practical, even during a short period of force five, when my crawl became ineffective. Have you a view on breaststroke in these conditions and open water generally? Thanks again for this terrific resource. Hi Michael. Thanks and sorry for delay replying. Generally breaststroke doesn’t do as well in head-on windy conditions simply because there’s more surface area exposed to the wind and the swimmer gets slowed down too much. Apart the very few who prefer it, breaststroke is rare in open water. Your solution seems workable for short distances and for predictable short wave intervals. For distance it sounds like it might be fairly exhausting. But if it works for you that’s the most important thing! if forgot to mention I always wear a wetsuit (5’9″/137 lbs) so generally am warm in water down to 52-53F. today I swam head on into a strong chop and found like you have mentioned keeping the head down helped. however by increasing my glide time just a bit I felt like I was more efficient in the water and used less energy for the same distance ( have to bike and run after swim you know, so less on swim means more on bike). maybe it was just less time getting thrashed by the chop??? but it felt more physical and mentally better. thank you for your articles and advice!! question about stroke frequency/glide in head on wind waves. does it help to take more of a glide time and less total strokes??? Only if you ant to go backwards and/or get hypo! You’re better off increasing your stroke rate, and trying to get under the chop where possible. Hi Donal, good stuff as usual. I was on Paul Newsome’s boat during his Channel swim last year. 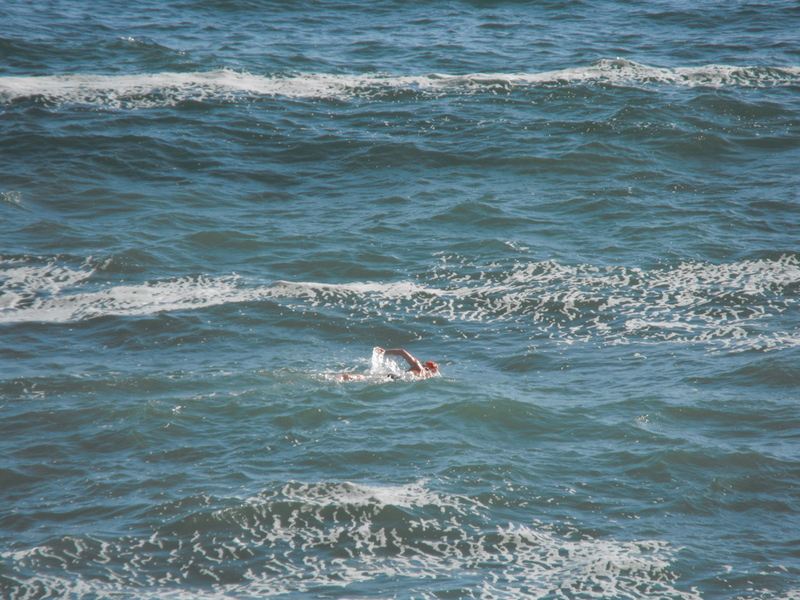 He spent most of the day swimming into a strong headwind, 1 – 2m waves, chop and spray. On the boat I was disabled with sea-sickness. He spent most of the time breathing to his non-natural left side as the wind and wave direction was slightly to the right, and he maintained a stroke rate in the region of 70-80 per minute throughout. I’m sure the high stroke rate helped him maintain momentum through the waves. These conditions occur in open water and swimmers need to be prepared to deal with them. BTW, I really enjoyed your piece on tides for the magazine. That’s going to the printer tonight and should be going in post w/c 11 June. Hey Simon, sorry for the delay replying, last week of training before taper. Yes, thanks very much, this was a very popular article on the blog. I always feel, not that I know the best way, but someone needs to be writing this stuff down. I was in Dover that week, staying in Varne also, I didn’t know Paul but had met his coach Shelly Taylor-Smith and got to talk to Paul the next morning, and yes, he said it was really tough, someone told me he was practically upside down at one stage. (I had 6 hrs in Force 5 myself out there (member of the unofficial Force 5 Club!) and know what it can be like.) I think enormous credit went to Paul for finishing, (and crew for sticking with him), true Channel swimmer, no higher praise can I give. Thanks on the article, I’m looking forward to seeing it in print, I’ve been thinking about sending you a list of proposed articles also. Great post, I really needed to see this one. Found an open-water group to train with finally! I’ll have to keep this in mind during our swim. Great, always happy to hear something is useful. I need to consider how I will on this area some more in the future. Maybe get Mrs Loneswimmer to take some photos of me getting battered around the place. Haha, well…. in the meantime, I will get my own bashing 🙂 I think that experience is the best teacher for the most part. I’m just glad that I have a group and don’t have to search and swim by myself! Thanks again for an interesting post. In response to your request for feedback on the new layout – on my browser (safari) the headlines on the home page split across words; and on reading a single article, I think the text is too small (easily adjusted I know). I preferred the previous layout, but that might be more about familiarity with it, than a considered design critique. Appreciate the feedback Carl. I noticed the headline issue, and it’s one that can’t be fixed without upgrading the CSS (for more cost). I’ve increased the base font size, I thought it was just because I had Chrome zoomed out. I’m still undecided. I like changing the layout every year, throw a dab of fresh paint on the virtual walls , so to speak, but there are few WordPress options that I like. The phrase ‘being swept out to sea’ is the thing that concerns me the most when considering a sea swim. Does this phrase originate in people being caught in a ‘rip current’ away from the beach? Is the advice to swim parallel to the beach correct? And how effective is it? Are there other techniques? hey Michael, yes, I’d guess it’s partly where it comes from, though every summer you’ll hear stories on the radio of being being drowned at the coast due to “freak waves” meaning in reality they were too close to the edge and didn’t understand how waves of different sizes arrive with swell. With rips parallel to shore will work as rips are usally very narrow, which often means aiming for where the waves are breaking harder and fairly close by.